If I asked you to name the most poisonous creatures on earth, you'd probably give me the name of a plant, or possibly a snake. The sushi fans would likely vote for pufferfish, and quite a few other dangerous species would surely make the list. 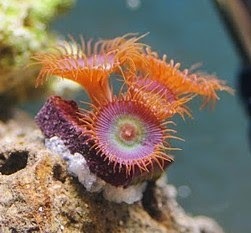 Palythoa coral - this species is called "Poseidon"
You put me in here with WHAT??? See the pretty green corals? They want to kill you. 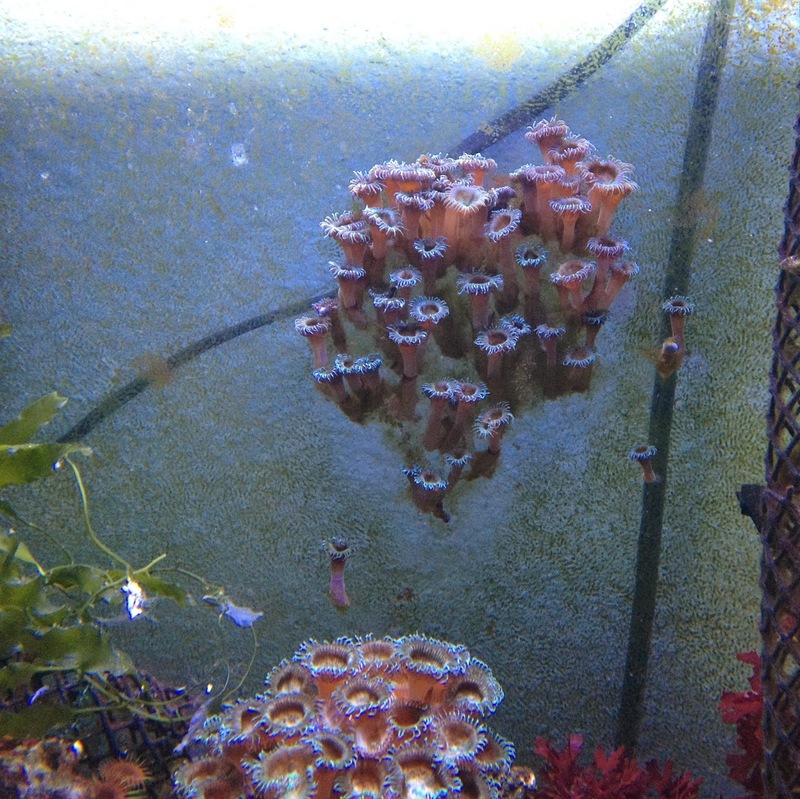 You can buy them at any aquarium store that sells soft corals, anywhere in the world. People love their brilliant colors, and because they look like flowers, but these are animals, not plants--and some of them can kill. Not all species in the order contain or produce palytoxins, and not all of the ones that do excrete it in large enough quantities to render an entire aquarium toxic. Palytoxin isn't absorbed through the skin, which means it has to enter the bloodstream directly--usually via the victim's eyes or an open cut. However, it can aerosolize in the presence of water vapor, and poison a victim through inhalation (which has happened when reef enthusiasts attempt to sterilize rocks by boiling or application of steam). Scientists officially "discovered" palytoxin in 1971 (ironically, the same year I was "discovered"...) but Hawaiians had known about the toxin for hundreds of years and even used it to poison spears and arrows. They harvested the toxin from a coral they called "limu-make-o-hana" -- "the Seaweed of Death from Hana." Not the seaweed of death. 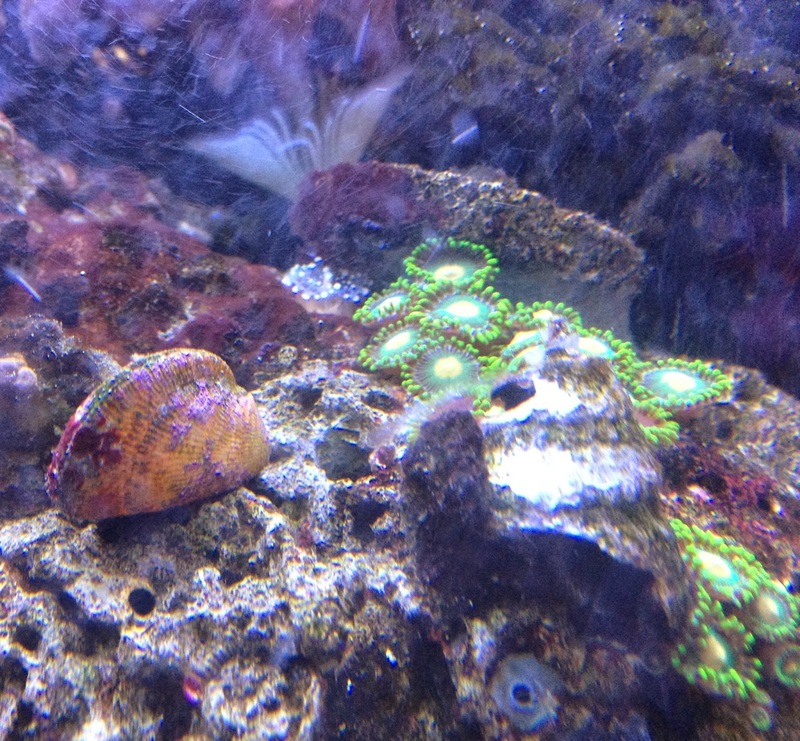 This is my abalone, Oscar, above a large colony of blue palythoas. 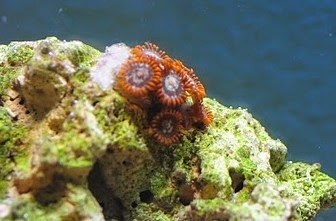 Many of the Hawaiian zoanthids and palythoas (both of which fall within order Zoantharia) do contain palytoxin, as do similar corals from other parts of the world. Normally, the corals keep the toxin in their bodies and excrete it in response to threats. 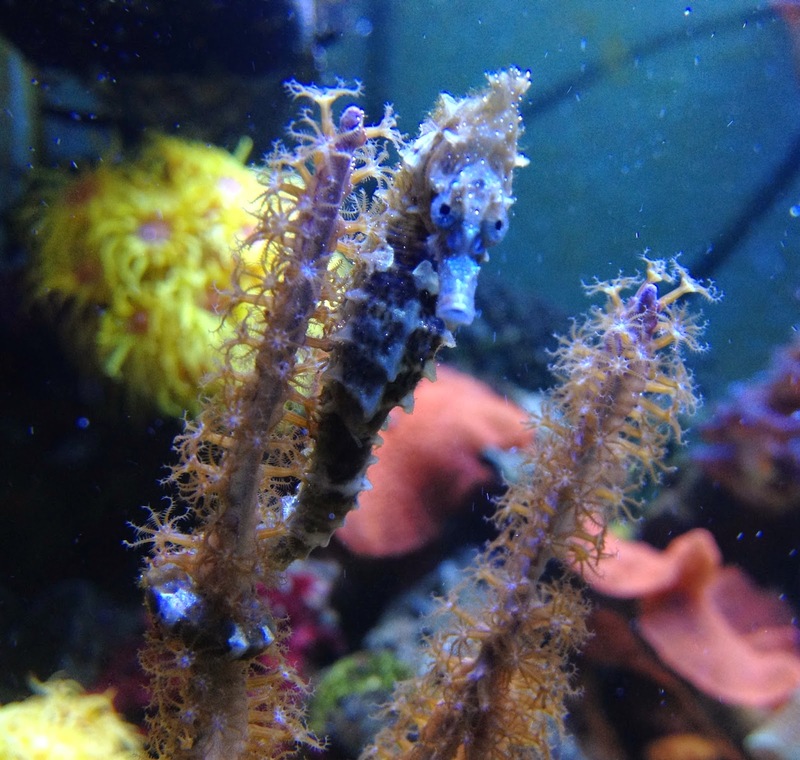 Unfortunately, the very act of splitting off polyps (the flower-like heads) or moving them to a new environment is often perceived as a mortal threat, causing the coral to excrete--or spit--a blob of toxic mucus. Smart aquarium keepers exercise special caution around these species. Ironically, the first night I ever blogged about palytoxin I also accidentally handled some new corals with an open paper cut...and ended up with palytoxin poisoning, though I didn't realize what had happened for several hours. Most likely, these are the ones that got me. Common name: "Fire and Ice"
Symptoms include dizziness, rapid heartbeat, nausea, cramps, diarrhea, lethargy, kidney failure, muscle spasms, cyanosis, and trouble breathing. When the poisoning proves fatal, the cause of death is normally heart failure (heart attack). I got lucky--my symptoms only included the dizziness, nausea, rapid heartbeat and a little trouble breathing. I self-medicated with Benadryl, water consumption, and rest, and recovered completely in about twelve hours. This colony "walked" away from the larger colony below it. Yes, they're semi-mobile. One more thing...there is no antidote for palytoxin. Vasodialators can help, but only if injected directly into the heart within moments after exposure. (Anyone seen the movie THE ROCK? Yeah...pretty much that, except that you die of a heart attack...and fortunately, your skins doesn't melt off your body.) In humans, the standard treatment is "supportive care." 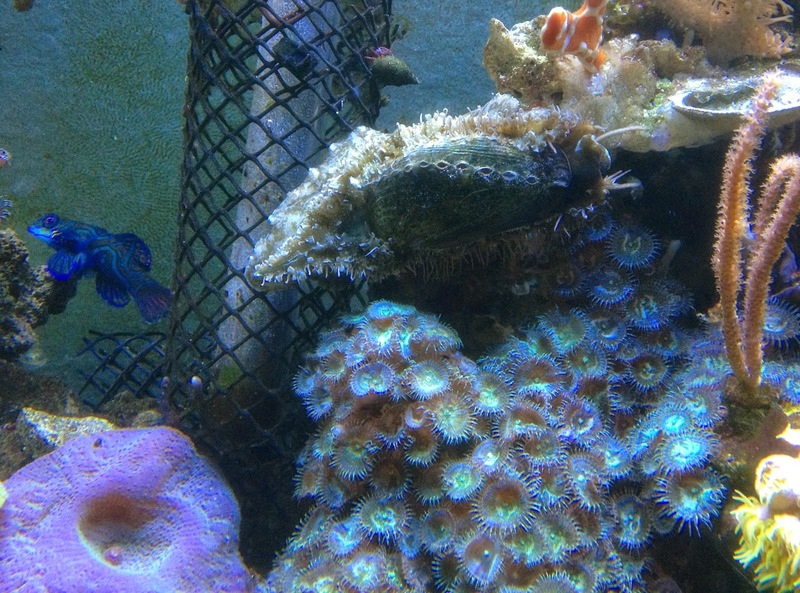 Palytoxin poisoning is rare, and seldom fatal--mostly because the majority of popular captive species don't contain the toxin, and the ones that do can "learn" that common handling isn't a serious threat. 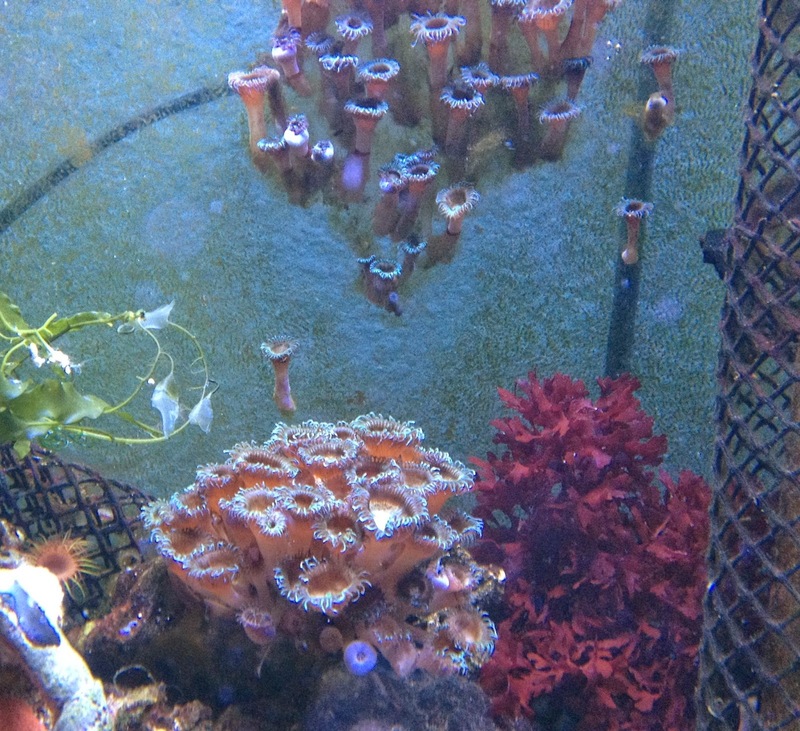 Also, aquarium water dilutes palytoxin on contact, making it far less likely that reef keepers will receive a toxic dose. That said, best practices in the aquarium world include the use of rubber gloves and glasses when handling dangerous species and not putting open cuts in the water. 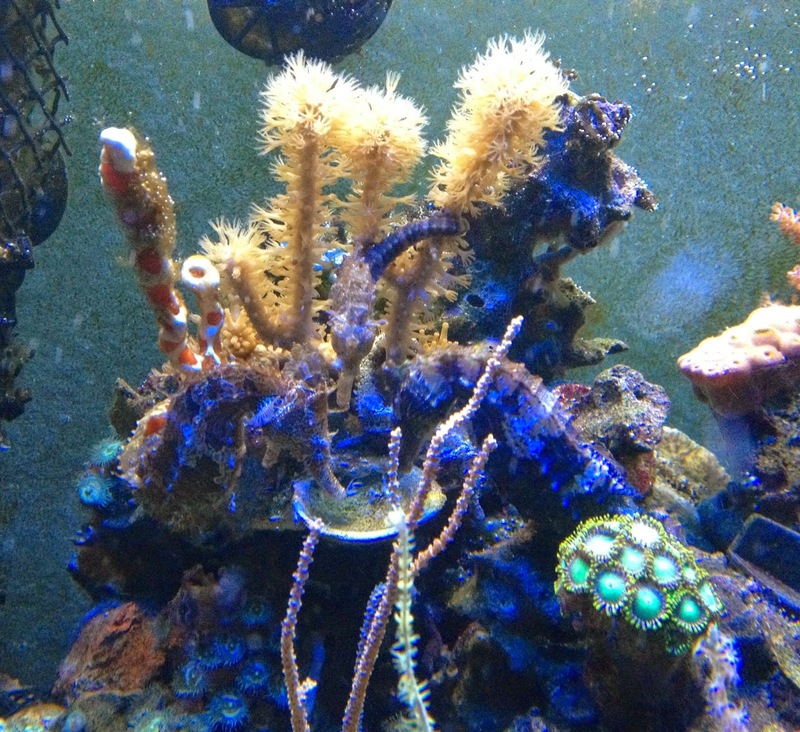 See the green zoanthids in the lower right? They tolerate seahorses hitching to them at suppertime. You can forget the snake, the scorpion and the pufferfish. That "innocent flower" under the sea will get you faster than all the others put together. Wow was that interesting. Thanks. Aww, Jeff...don't you trust my flowers? I sense the makings of a murder plot here! That was fascinating. I am going to put some of these wee chappies into my new book, in a tank next to the Prince Axel Wonderfish! Excellent! The good news is, most fish don't bother them (and are not bothered by them) so they're definitely reef-safe. To fess up folks, my current release uses just such a poison as a central plot device, though I didn't disclose the source (and varied the application point). It was suggested to me by a karate master who told me how assassins once applied it by an ingenious bare hand method that harmed only the victim. I find new wonderful things on the reef every day. Aquariums are wonderful things. What Lisa and Zoe said! But I would have to figure out to put a sea anemone in the highlands of East Africa. I think I will have to make due with the snakes, though I doubt I would be able to figure out how to use one as murder weapon and make it also detectable as an intentional killing. I can't even figure out how to get my iPhone to let me comment here. Hence my days of absence from these delightful precincts. It does let me read the posts. Otherwise. I might have thrown it in Lake Pontchartrain. Maybe a snake in a basket? Deliver it to the victim and let the snake do what it does best? Or, there's always the Indiana Jones option....BAD DATES. Another lesson from the reef. I wonder if people not wearing flippers and ignoring the instructions not to walk on reefs die now and then? It's an extreme punishment but it infuriates me to see people ignoring the signs and stomping around. It wouldn't surprise me if a few of them suffered at least some serious illness, if not death - and not only from palytoxins. There are lots of toxic species on reefs, and most of them will gladly sting, bite, or cut an offending foot. It bothers me when I see people harming the reefs and tide pools, too. I know it's mostly ignorance, and a desire to "see" what's out there - but it would be much nicer if people learned to look without touching and observe without destroying the things they're curious about.